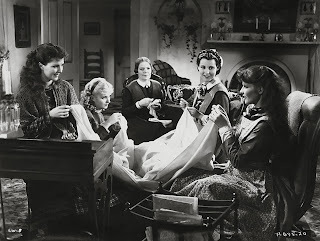 A warm-hearted adaptation of the classic Louisa May Alcott novel, Little Women may lack sharp drama, but successfully achieves the desired tone of nostalgic congeniality. It's the American Civil War, and Mr. March (Samuel S. Hinds) is away from his Concord, Massachusetts family, serving as a preacher with the army. In his absence, his wife, known only as Marmee (Spring Byington), has four teenaged daughters to look after. Josephine (Katharine Hepburn), better known as Jo, is an aspiring writer, extroverted, tomboyish and not yet comfortable with the behaviour expected from a young lady. 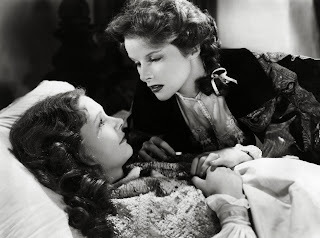 Amy (Joan Bennett) is feminine, pretty, and leans towards being self-centred. The practical Meg (Frances Dee) is good with dressmaking and needlework, while the sensitive Beth (Jean Parker) helps with housekeeping duties and plays the piano. The Marchs are just barely financially comfortable, but Marmee teaches her girls to always help others before thinking of themselves, and the family gets by on plenty of love between the sisters and their mother. Crotchety Aunt March (Edna May Oliver) is well-off, but contributes support in exchange for a never ending stream of negativity. Living nearby is the much more wealthy and crusty neighbour Mr. Laurence (Henry Stephenson), his grandson Laurie (Douglass Montgomery) and Laurie's tutor John Brooke (John Davis Lodge). Jo and Laurie fall in love, Meg and John also start a courtship, but bad news from the war front followed by a serious sickness in the March household cast a shadow over the family's happiness. There are no heroes or villains in Little Women. The story, inspired by Alcott's own household, is simply about normal people navigating through the course of life. None of the characters are perfect, and all behave according to a comfortably familiar code derived from conventional motivations. While the prevailing normalcy robs the film of any sense of genuine conflict or difficult choices to be made, it is also a welcome, and all too rare, depiction of true family life guided by good values without being sugary in its idealism. Director George Cukor maintains a good handle on the sprawling narrative, the film packed with about 10 major characters who need to be carefully introduced, and the two hour running length is put to good use in keeping the girls and their beaus busy with life's diverse lessons, joys and heartaches. Alcott adapted her own novel into the screenplay, and avoids getting bogged down in any one character or event. Even when Jo strikes out on her own and moves to a New York boarding house, the film does not lose touch with events back home, and the character of Professor Bhaer (Paul Lukas) emerges as evidence to Jo that some level of social eccentricity is indeed lovable. Katharine Hepburn is easily the most prominent member of the large cast. Already 26 years old but convincingly portraying Jo as a gangly teenager, Hepburn radiates the confused energy of a lively girl transforming into womanhood sooner than expected. War, love, financial stress, sickness and the burning ambition to be a writer all propel Jo towards adulthood, and particularly in the second half of the film Hepburn finds the soul of a young woman defining herself without losing the precious connections to her family. The Little Women all need to experience the struggles of growing up, but how they handle the future will always be defined by the foundations built at home.